Fans of Apple will call it part of the company’s genius. Those that love to find things wrong with Apple will say nothing new comes out of Cupertino. Either way, the reality is that Apple watches what is available in the world, has their design group redo the look and feel, then connects it to everything else they produce. While there were smart phones prior to the iPhone, they didn’t have all the dots connected so they didn’t receive the emotional connection that people had with the iPhone. Now of course, there are many other options in the field, all of which where copy/redesigns of the smartphone before it. Apple learned their lesson after the Newton, people didn’t understand the PDA concept of a computer being part of a person’s life rather than hardware used to write, calculate and draw with. The device showed that introducing completely new takes a highly unlikely ah-ha moment of the public, it is better to work into the use by modifying a currently accepted device… the phone. OK, jump to today and the future of the Apple iWatch on Kickstarter. 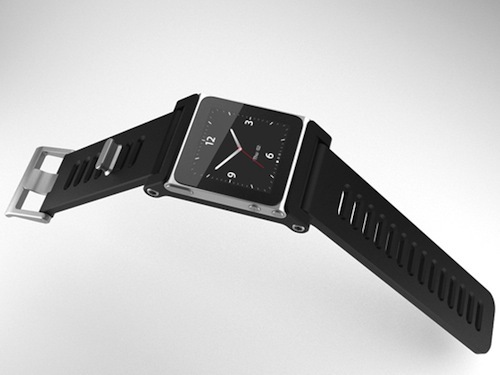 Towards the end of 2010, a company called Minimal offered a Kickstarter project for a touch screen watch. The project, Tik Tok, was a watch band and two creative ways of holding a iPod Nano. It received pledges of close to 1 million dollars. The Nano at the time was a small square device that was all 240 pixel touch screen on the front, a couple buttons on the outer edges, headphone jack and a 30 pin connector. There was basic built-in apps on the iPod, with no way of adding more. Music can be loaded and played, as well pictures and it was set up from the factory to work with Nike running devices. There was no video playback, camera, or games. There was a couple different watch faces. The second year of the Nano came with more (17) watch faces from Apple. 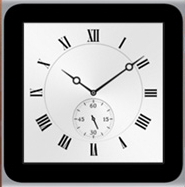 After the Kickstarter project wrapped up, the Tik Tok was available online, many gadget stores and even Apple’s stores. There appeared to be a market for an Apple watch that could be used as a timepiece, a radio, a audio playback and view pictures. A lot of people complained about no audible alarms unless the headphones where plugged in and the need to connect via the 30 pin connector to a computer to put things on and remove content from the Nano. Even though the Nano had a large clip on the back, runners started reporting liking the watch band mounting over the clip as way to gather running data (Nike), timing their run and listening to music. Just about everything needing to be done to interact with the Nano watch is a tap or swipe across the screen.On a personal note, no one with knowledge of the subject told this to me, it was interesting to see the Nano go back to the rectangle shape and video play back like the hardware prior to the square device. Perhaps, it was to avoid the comparison when a ‘iWatch’ was introduced to the Nano watch option. More recently is the Pebble Kickstarter Project. The team that put the project up for Crowd Funding actually stopped accepting more money after they passed 10 Million dollars. Their concern was how long it would take to fill that many orders on a new device being created by a very small group of talented folks. The Pebble connects to the iPhone via Bluetooth. It receives text messages, mail (limited qty of characters), alerts, alarms and caller ID. The watch has multiple watch faces, loaded via the iPhone. It can also be used to control music being played on the iPhone. The hardware is nicely done. Not what anyone would call high-end, but it meets the need. Like the Nano, it is sealed hardware with a few buttons around the outer edge. The only connector is a specialized magnetic charging cable (7 days use per charge), which doesn’t have a positive connection so I always doubt myself that I have it connected properly. Between the two, if Apple was to do a ‘smart’ watch, a person can back into what it will have. Of course, there will be surprises, but using Apple’s recent history of using available information they will use what is working. Video playback and a camera would be nice, but not likely. Both Tik Tok and Pebble has shown that the iPhone is the watch/clock that people use now. Unless a watch is a fashion statement or tied to data, watches are not being worn since a smartphone has everything. Apple didn’t jump onto the cable less charging and wireless only content management on the iPhone, instead releasing a special plug so expect to see that continue on a watch. Though, Apple does seem to be heading in the direction of no more wires as the Cloud solutions mature. Bluetooth is assured but will Wifi appear to start backup and data movement though iCloud? Touch screen, but the hardware buttons are in question. The buttons will need to be easier to access than the Nano and high quality than the Pebble. It is a good time to move volume control to the headphones only. Pebble has shown that pushing information from the iPhone to the watch is very handy, as long as there is a vibrate notification. Otherwise, having to look at your wrist all of the time, particularly with long sleeve shirts/jackets, it’s easy to pull the iPhone out of the pocket to check. Loading apps will not be supported since it would mean a new version of all non-Apple developed apps. I can see the Apple OSX apps like Reminders being viewable on the watch, syncing with the desktop. Since there will be no way to enter data, beyond viewing desktop/iPhone created data, there is only the need to control music, app selection (Nike will continue to be built in), images viewing and watch/alarms. Unless Apple is doing the face/head and band as a single unit, the Pebble has a nice option of being a standard band size so it can be replace by a user without factory help. All of the ‘concept drawings’ floating around the Internet are fun to see. But, remember the Apple history over the last 10 years. Tweak and making better without being so radical that the finished product requires people to be told how the device will integrate into their lives. Clean, nice looking, easy to use and well connected… all lessons learned from the Apple’s iWatch predecessors available through Kickstarter.